Acute and sub-chronic toxicological evaluation of ethanol extract of Solanum trilobatum Linn. Parasuraman*, S., Yu Ren, L., Lau Chik Chuon, B., Wong Kah Yee, S. (2018). Acute and sub-chronic toxicological evaluation of ethanol extract of Solanum trilobatum Linn.. Research Journal of Pharmacognosy, 5(1), 13-21. S. Parasuraman*; L. Yu Ren; B. Lau Chik Chuon; S. Wong Kah Yee. "Acute and sub-chronic toxicological evaluation of ethanol extract of Solanum trilobatum Linn.". Research Journal of Pharmacognosy, 5, 1, 2018, 13-21. Parasuraman*, S., Yu Ren, L., Lau Chik Chuon, B., Wong Kah Yee, S. (2018). 'Acute and sub-chronic toxicological evaluation of ethanol extract of Solanum trilobatum Linn. 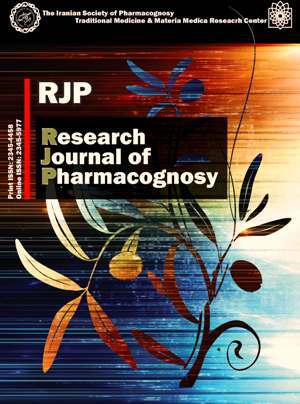 ', Research Journal of Pharmacognosy, 5(1), pp. 13-21. Parasuraman*, S., Yu Ren, L., Lau Chik Chuon, B., Wong Kah Yee, S. Acute and sub-chronic toxicological evaluation of ethanol extract of Solanum trilobatum Linn.. Research Journal of Pharmacognosy, 2018; 5(1): 13-21. Unit of Pharmacology, Faculty of Pharmacy, AIMST University, Bedong, Kedah, Malaysia. Background and objectives: Solanum trilobatum plant parts such as berries and flowers are normally used for the treatment of respiratory illnesses. The toxicity profile of the plant and its parts are not clear. Hence, the present study was planned to investigate the toxicological effects of ethanol extract of leaves of S. trilobatum (EEST) using acute and sub-chronic toxicological methods in Sprague-Dawley (SD) rats. Method: Leaves ofS. trilobatum were extracted with ethanol using hot percolation method. Acute and sub-chronic oral toxic effects of EEST were tested in SD rats. Acute toxicity testing was carried out as per guidelines set by OECD. In sub-chronic toxicity testing, animals were treated with 100, 200 and 400 mg/kg EEST for 30 days. During the study, the animals were monitored for changes in their behaviour at regular intervals. At the end of the study, blood sample was collected from all animals for biochemical analysis, they were sacrificed and organs such as brain, lung, liver and kidney were collected for histopathological analysis. Part of the brain was used for estimation of dopamine and the remaining tissue was used for histopathological analysis. Results: In acute toxicity testing, EEST did not show mortality up to 2000 mg/kg. In sub-chronic toxicity testing, EEST at 200 mg/kg and above doses caused cannibalism. At the end of the study, EEST decreased locomotor action and immobilization time. Histopathological analysis showed mild to moderate toxicity in 400 mg/kg treated animals and no significant changes were observed in biochemical parameters compared to control group. Conclusion: The present study concluded that, EEST exerted mild to moderate toxic effects on rodents. EEST caused cannibalism, increased the dopamine level in brain and histopathological alterations in lungs, liver and kidneys. Lahlou M. The success of natural products in drug discovery. Pharmacol Pharm. 2013; 4(3A): 17-31. Oliver SJ. The role of traditional medicine practice in primary health care within Aboriginal Australia: a review of the literature. J Ethnobiol Ethnomed. 2013; 9: 46. Alomar MJ. Factors affecting the development of adverse drug reactions (Review article). Saudi Pharm J. 2014; 22(2): 83-94. Shaw D, Graeme L, Pierre D, Elizabeth W, Kelvin C. Pharmacovigilance of herbal medicine. J Ethnopharmacol. 2012; 140(3): 513-518. Parasuraman S, Thing GS, Dhanaraj SA. Polyherbal formulation: concept of ayurveda. Pharmacogn Rev. 2014; 8(16): 73-80. Santhan P. Leaf structural characteristics of important medicinal plants. Int J Res Ayur Pharm. 2014; 5(6): 673-679. Sundari SG, Rekha S, Parvathi A. Phytochemical evaluation of three species of Solanum L. Int J Res Ayur Pharm. 2013; 4(3): 420-425. OECD series on testing and assessment, Number 24: Guidance document on acute oral toxicity testing. Available at http://www.oecd.org/officialdocuments/publicdisplaydocumentpdf/?cote=env/jm/mono(2001)4&doclanguage=en, 2016. Parasuraman S, Raveendran R, Rajesh NG, Nandhakumar S. Sub-chronic toxicological evaluation of cleistanthin A and cleistanthin B from the leaves of Cleistanthus collinus (Roxb.). Toxicol Rep. 2014; 1: 596-611. Vogel HG, Ed. Drug discovery and evaluation: pharmacological assays. 2nd ed. Berlin: Springer, 2002. Butchbach ME, Edwards JD, Burghes AH. Abnormal motor phenotype in the SMNDelta7 mouse model of spinal muscular atrophy. Neurobiol Dis. 2007; 27(2): 207-219. Manikkoth S, Deepa B, Sequeira M, Joy AE, Rodrigues R. Assessment of brain dopamine levels to evaluate the role of Tylophora indica ethanolic extract on alcohol induced anxiety in Wistar albino rats. J Young Pharm. 2016; 8(2): 91-95. Hisahara S, Shimohama S. Dopamine receptors and Parkinson's disease. Int J Med Chem. 2011; Article ID 403039. Kelly MA, Rubinstein M, Phillips TJ, Lessov CN, Burkhart-Kasch S, Zhang G, Bunzow JR, Fang Y, Gerhardt GA, Grandy DK, Low MJ. Locomotor activity in D2 dopamine receptor-deficient mice is determined by gene dosage, genetic background, and developmental adaptations. J Neurosci. 1998; 18(9): 3470-3479. Beaulieu JM, Gainetdinov RR. The physiology, signaling, and pharmacology of dopamine receptors. Pharmacol Rev. 2011; 63(1): 182-217. Schindler CW, Carmona GN. Effects of dopamine agonists and antagonists on locomotor activity in male and female rats. Pharmacol Biochem Behav. 2002; 72(4): 857-663. Beninger RJ. The role of dopamine in locomotor activity and learning. Brain Res. 1983; 287(2): 173-196. Vilpoux C, Leroux-Nicollet I, Naudon L, Raisman-Vozari R, Costentin J. Reserpine or chronic paroxetine treatments do not modify the vesicular monoamine transporter 2 expression in serotonin-containing regions of the rat brain. Neuropharmacology. 2000; 39(6): 1075-1082. Study of possible correlation between grip strength decreased and dopamine. [Accessed 2016]. Available from: http://factmed.com/study-DOPAMINE-causing GRIP%20STRENGTH%20DECREASED.php. Wang GJ, Volkow ND, Logan J, Pappas NR, Wong CT, Zhu W, Netusil N, Fowler JS. Brain dopamine and obesity. Lancet. 2001; 357(9253): 354-357. Volkow ND, Gur RC, Wang GJ, Fowler JS, Moberg PJ, Ding YS, Hitzemann R, Smith G, Logan J. Association between decline in brain dopamine activity with age and cognitive and motor impairment in healthy individuals. Am J Psychiatry. 1998; 155(3): 344-349.